I’m starting a new line of blog posts in which I’m going to give out a few tips and tricks I’ve picked up during the past years. I’m going to start with one of the most common mistakes I often face when reading code. To demonstrate that, I’m going to use LinqToSQL as my data access method (although the problem can be found in any kind of Data access technology) and use the the same model I used in my earlier Caching series. 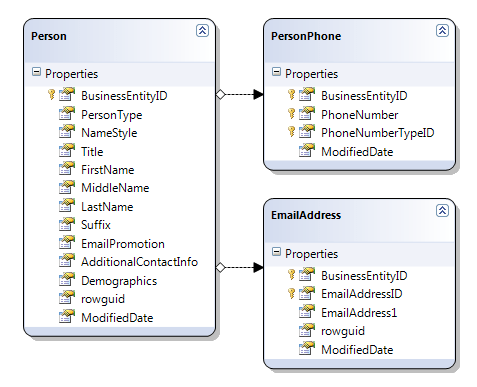 As you can see the model is very simple and contains just three entities, a Peson, its Phones and its Email addresses. Next I’m going to create a web form in which I want to display a list of Persons along with their email address. To do that I’m going to add a Repeater control which I’m going to Bind to the Person retrieved from the store. Since the Email Address is not in the same entity as the Person I’m going to take advantage of the repeater’s OnItemDataBound event to fetch the Email address of these persons. So typically would find something like that in the code behind. This will work just fine but what some developers don’t realize is that that this will make as many queries to the database as the records on the Persons Table, cause it’s time a Person record is Data bound I’m querying for its Email Address on the ItemDataBound Event Handler. Although this kind of behavior is pretty obvious and I’m pretty sure that most of you are already aware of it, there are times when this behavior is disguised and rather difficult to spot. For example the following code has exactly the same problem since the GetEmailAddress method is going to be called as many times as the person records (although there is no ItemDataBOund handler). And of course this behavior doesn’t only apply to repeaters but in every list control (drop down list, GridView, Checkbox list etc) that is going to be bound to fields belonging to more than a single entity.